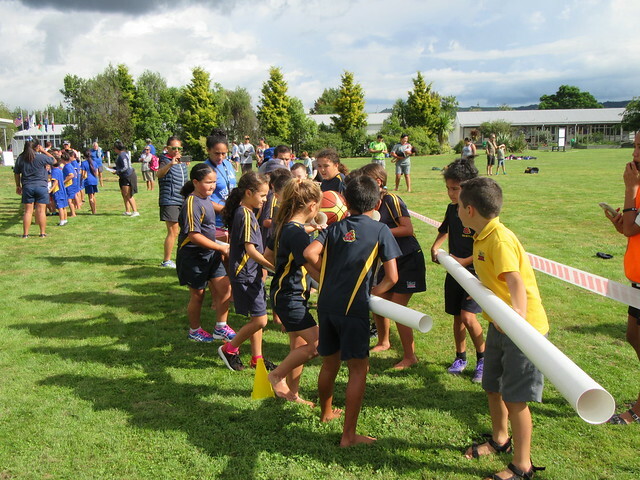 The weather managed to hold out for yesterdays annual Top School event at Rotorua Intermediate where 230+ children from 13 CBOP Schools took part in a range of team building activities. Teams of 12 students rotated around 7 different activities including Sack Races, Bridge Crossing, 4 Legged Race, Stompers, Barrel Run, Downpipe Basketball and one of the favourites the Horizontal Bungy which saw the students slipping and sliding amongst soap suds on a giant slip ‘n slide. Well done to all the students who took part and a big thankyou to Rotorua Intermediate for hosting such an awesome event.